Movies that have storylines that crash through each other are not only produced in LA, but the city does seem to be well suited to them because it’s one of the only places where strangers are not likely to have much to do with each other, therefore the theory of six degrees of separation is a bit more intriguing. There have been plenty of stories written in this fashion and based in LA such as Magnolia, and Crash, and now a new Matthew Leutwyler film called Answers to Nothing that features a group of lost souls that are attempting to get over their own personal demons. The basic plot line of the movie revolves around the search for a missing girl in a neighborhood that the strangers share, but they do not have much more in common outside of knowing of the missing girl and the fact that they are all ok with being less than perfect as long as no one else knows it. Packed with sociopaths, the plot will make most people a bit queasy, but only because some of the less than brilliant revelations are not so farfetched and can be a bit disturbing to swallow. One of the main characters attempts to justify their own form of vigilante work, while another one thinks that it’s best not to tell his wife about the affair he is in the middle of to protect her from any pain. Another is filled with self-loathing racism and these are just the more positive characters which should offer just a brief illustration of the dark nature of the movie. 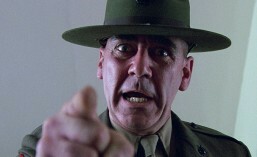 There is a sense that the film is supposed to be a bit emphatic, but unless Leutwyler is really this dark then it is actually hard to connect with the characters because they just invoke feelings of distaste. Despite this fact, however, the movie is almost worth seeing due to a performance by Dane Cook, and the stand-up comedian really seems at home in a dramatic role which is pretty unlikely given his previous history of work. Cook does a wonderful job of coming off as a jerk that is callous and shallow and it’s fun to watch him try to get emotionally invested in anything and because Cook does such a wonderful job it’s hard to imagine this character gets any type of closure or growth out of anything he does. Also wonderful is Aja Volkman who plays the mistress of Cook’s character Ryan. Ryan is a shrink that should be focused on the fertility treatments his wife is getting to help them have a child, but of course he is more interested in the rock star Tara and what she can do below the belt. Both the women are treated pretty horribly and Ryan is quickly established as the one to hate without reason because while he may have some daddy issues, as a shrink you would think he could do a little better job of dealing with them. 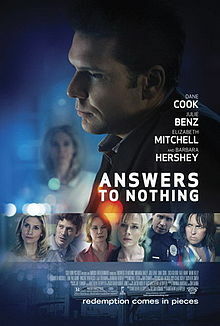 This entry was posted in Movie Review, Movie Trailer and tagged Answers to Nothing review, Answers to Nothing review trailer, Answers to Nothing trailer, Dane Cook, Elizabeth Mitchell and Barbara Hershey., Julie Benz, Miranda Bailey, Zach Gilford. Bookmark the permalink.